"This is a tremendous achievement by our staff," Publisher J. Brian Monihan said. "Everyone works very hard each week to produce the best newspaper possible for our community. 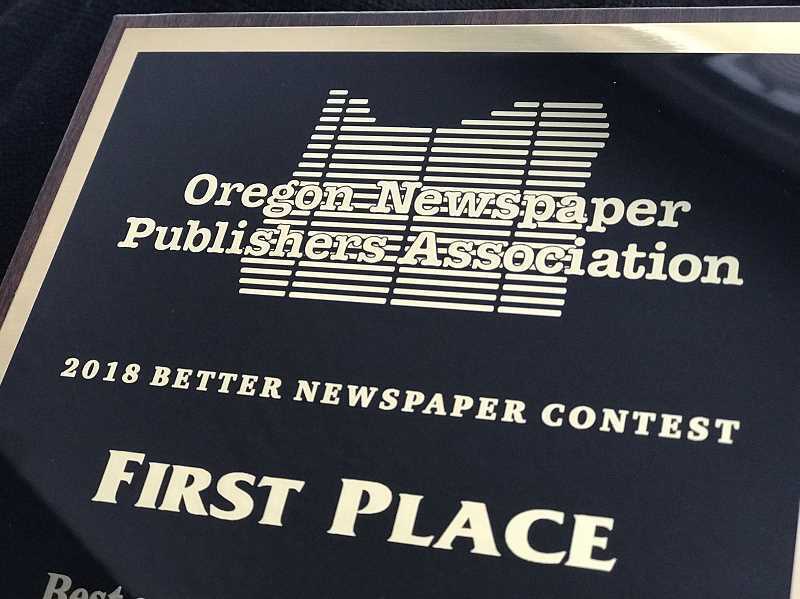 To be recognized by your peers as one of the best newspapers in Oregon is very humbling." The Spokesman — which observed its 34th year as news leader for the Wilsonville community — was honored with first place awards for a news story about the community's preparation for the fallout from the 2017 solar eclipse by reporter Andrew Kilstrom, its "Perspectives" magazine highlighting dedicated volunteers in the community, and a profile of former Wilsonville High School athlete Zach Reichle by reporter Corey Buchanan. Kilstrom was honored with a second place award for Best Writing, judged by a selection of his stories. First Place: Best Spot New Coverage, Andrew Kilstrom; Best Sports Story, Corey Buchanan; Best Special Section or Issue, Spokesman staff. Second Place: Best Special Section or Issue, Spokesman staff; Best Business Coverage, Andrew Kilstrom; Best Feature Story Personality, Clara Howell; Best Writing, Andrew Kilstrom; Best News Photos, Vern Uyetake. Third Place: Best Enterprise Reporting, Claire Green. For more information on the award winners and the contest, visit orenews.com.